Most indicators have one major weakness - they are not suited for use in both trending and ranging markets. The key feature of the Directional Movement System is that it first identifies whether the market is trending before providing signals for trading the trend. ADX turns up from below +DI and -DI. The Commonwealth Bank of Australia Limited is plotted with 14-day +DI, -DI and ADX. -DI crosses to above +DI so trade only short. 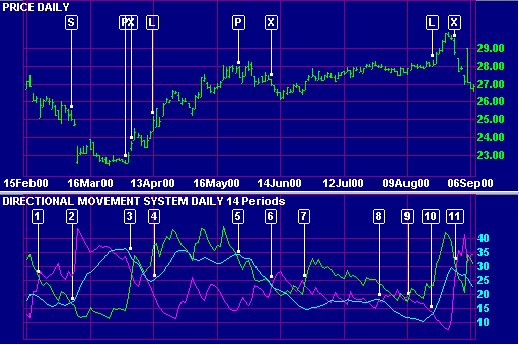 Go short when ADX rises above +DI. Take profits when ADX turns down while above +DI and -DI. Go long as ADX starts rising while above -DI. Exit long trade and trade only short as -DI has crossed to above +DI. Trade only long as +DI has crossed to above -DI. One view is that you should go long whenever ADX rises above -DI, but ADX has remained very low and flat and it would be advisable not to trade until ADX has risen by at least 4 steps above its recent low. Go long when ADX rises above -DI. Exit long trade when +DI falls below -DI. The default Directional Movement System uses 14 day smoothing. This is not equivalent to a 14 day EMA. Click here for details. Edit Indicator Settings explains how to alter the default settings. Indicator Panel shows how to set up an indicator. You cannot have both +DM and -DM on the same day. If there is an outside day (where both calculations are positive) then the larger of the two results is taken. An inside day (where both calculations are negative) will always equal zero. Record the difference between +DI14 and -DI14 as a positive number.